With its pointed ear tufts and beard-like ruff, the lynx looks like a huge house cat re-imagined by Dr. Seuss. Its long legs and wide furry feet permit the lynx to hunt well in snow, which is historically common across its range. The lynx has an intimate biological relationship with the snowshoe hare, its favorite prey. Elusive solitary hunters, the lynx in mythology is known as the keeper of forest secrets. The Canada lynx’s Eurasian cousin is the national animal of Macedonia and Romania. The U.S. Fish and Wildlife Service originally listed the Canada lynx as threatened primarily because of habitat loss and overtrapping. The impact of climate change on U.S. populations in the lower 48 states is raising new concerns. 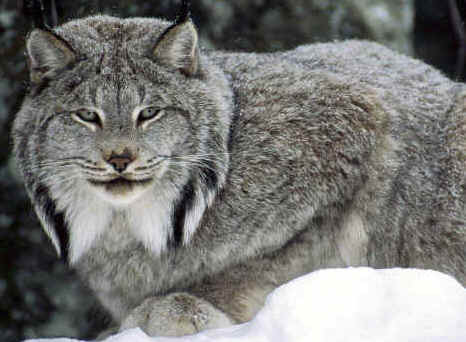 The lynx and its main prey, the snowshoe hare, are adapted to deep snow cover. Lynx hunting success (and therefore prey availability) has a great deal to do with snow conditions. Warm winter periods can affect snow texture, depth, and extent of snow cover. Climate change may also reduce the extent and composition of their primary habitat – boreal and alpine forests. Deep snow typically excludes the lynx’s main competitors – coyotes and bobcats – and its predator, the mountain lion, from its winter habitat. Less snow cover could mean more competition and predation from other carnivores. According to the International Boreal Conservation Campaign, "The boreal forest ecosystem supports nearly 50% of the world's remaining intact forests," and is home to "billions of migratory birds and some of the world's largest populations of wolves, bear, and caribou." Because global warming is occurring at a faster rate closer to the poles, the boreal forest is particularly vulnerable. As forests warm, they become more vulnerable to insect infestations. Bark beetles are ravaging millions of acres of trees. The dead trees become kindling for forest fires throughout the region.